The recent media coverage of the Queensland Coroner’s Inquest into the death of three year old Ruby Chen has left me perplexed. As a Registered Nurse working in paediatric critical care and a paramedic with over ten years experience this case unsettles me – how could something as simple and common as administering a bag of fluid go so catastrophically wrong? And as the parent of a three year old this case frightens me to the bone – how can a child with a seemingly minor and common illness be pronounced deceased shortly after a routine aeromedical transfer? In an attempt to find answers to my questions I decided to read every detail of the Coroner’s Inquest and write this summary for like-minded nurses, paramedics and parents. During August 2012 when Ruby’s mother took her to see their local doctor for the second time in three days it was decided that Ruby should be admitted to the local Blackwater Hospital for observation and management of her dehydration and fever. While in Blackwater Hospital Ruby was given intravenous (IV) fluid via an IV fluid pump which delivers fluid at a precise rate with the added safety of being able to detect even the slightest amount of air in the IV fluid line. The staff at Blackwater Hospital in consultation with staff at the larger Rockhampton Base Hospital decided the level of care required by Ruby was best delivered at Rockhampton Base Hospital and a helicopter aero-medical transfer was organised. When the helicopter paramedics arrived at Blackwater Hospital Ruby had been given 850mL of a one litre IV fluid bag. The paramedics requested the IV line to be taken down as the line could only be used with the IV fluid pump which was deemed to be too large to take into the helicopter. A new IV line was given to the paramedics by a nurse and this line was inserted into the original IV fluid bag which had 150mL remaining. The process of inserting a new IV line into an already used or ‘spiked’ IV fluid bag is known as ‘re-spiking’. This new line was primed (flushed with IV fluid to remove the air from within the tubing) by the lead paramedic at the helicopter and a small amount of fluid was spilt on the ground outside the helicopter. The volume of fluid remaining in the IV fluid bag was estimated to now be 115mL. Due to limited space in the helicopter and a desire to keep Ruby close to her mother, one of the paramedics sat in the cockpit next to the pilot and the lead paramedic sat next to Ruby and her mother in the cabin. Prior to take off the lead paramedic consulted with the Queensland Emergency Medicine Retrieval Coordination Centre. The administration of IV fluid at a rate of 250mL per hour was ordered and the lead paramedic commenced this soon after departure using the partially used IV fluid bag from the hospital with the new giving set, also from the hospital. The IV fluid bag was placed inside an opaque pressure bag to squeeze the contents of the bag through the IV line into Ruby’s vein. Twenty four minutes after the IV fluid was commenced in the helicopter Ruby had a seizure then rapidly went into cardiac arrest. The lead paramedic requested the pilot to land immediately and the pilot determined it was safest and most expedient to proceed to the planned landing site which was seven minutes away. The pilot changed flying style to accommodate for Ruby’s time critical condition. Ruby was immediately conveyed to Rockhampton Base Hospital where futile resuscitation attempts were ceased and she was declared deceased. The medical staff at Rockhampton Base Hospital were (presumably) so perplexed by Ruby’s sudden and inexplicable death that they performed a chest X-ray following her death and another the following morning. The chest X-Rays taken by the medical staff at Rockhampton Base Hospital revealed air in the chambers of Ruby’s heart and blood vessels and provided the first clue of what would later be concluded by autopsy as Ruby’s cause of death – massive air embolism or air in Ruby’s circulatory system. Approximately 70mL of air was found replacing the blood in Ruby’s heart (right atrium and ventricle), air was also found inside Ruby’s major blood vessels (aorta and superior vena cava) and many of the superficial veins covering the surface of her brain. Most unusually, air was also found inside the internal jugular vein. So where did all of the air in Ruby’s circulatory system come from? Before identifying the source of the air it is important to note that the Coroner’s Inquest concluded there was no evidence that Ruby’s death was the result of malice and that no referral was made by the Coroner against any person or entity. It was not immediately known by the independent medical expert acting for the Coroner where the air in Ruby’s circulatory system came from until just prior to the commencement of the inquest in September 2014. By process of elimination and armed with the belief that the air must have come from the IV line the independent medical expert concluded the air came from the partially used IV fluid bag. Further investigation revealed the air entered the used IV fluid bag prior to re-spiking. It should be noted that IV fluid bags do not contain more than a trace amount of air and it was the process of re-spiking that trapped a lethal amount of air in the IV fluid bag. (The author replicated the scenario and found a total of 452mL of air in the IV fluid bag after re-spiking.) The air trapped in the IV fluid bag entered Ruby’s circulatory system via the IV fluid line after the remaining 115mL of fluid ran out. This occurred twenty four minutes after IV fluids were commenced in the helicopter. Due to the pressure cuff’s opaque appearance the paramedic was unable to easily recognise when the fluid in the IV fluid bag ran out and the air was squeezed through by the pressure cuff. The setup used in this rare set of circumstances created the perfect storm for this catastrophic event. The confined space in the helicopter was listed as the reason an infusion pump was not used. Additionally, the limited height in the cabin meant gravity feeding IV fluid at the desired rate of 250mL per hour was not possible. Therefore the use of the pressure cuff on the partially used IV fluid bag was employed to squeeze the IV fluid in at the desired rate. The air in the partially used IV fluid bag was a catastrophic seed which germinated in the most unlikely sequence of events. The independent medical expert further concluded that these circumstances were so rare that neither he nor any of his colleagues (irrespective of their level of experience) could have seen or predicted such an outcome. It is here where three simple yet painful statements are made that make this such a difficult case to accept. 2. If an infusion pump had been used Ruby would still be alive as the pump would have alarmed and ceased the infusion when air was detected in the line prior to it entering Ruby’s circulatory system. 3. If the IV fluid was gravity fed (without the pressure bag) Ruby would still be alive as Ruby’s venous pressure would have stopped the final few centimetres of IV fluid from entering her circulatory system, preventing any air from entering her circulatory system. In short, a lethal amount of air had entered the used IV fluid bag which when re-spiked and administered with the pressure bag resulted in a fatal dose of air being squeezed into Ruby’s circulatory system after the IV fluid had run out. While there was no evidence that Ruby’s death was the result of malice and no referral was made by the Coroner against any person or entity, the Coroner did find that one area of the paramedics’ treatment and care was not in accordance with best practice. Specifically the one area was the re-spiking of the used IV fluid bag. The Coroner did however take note of the independent medical expert’s conclusion that these circumstances were so rare that they could not be predicted and accordingly no referral was made against the paramedics. In order to prevent a re-occurrence the Coroner did however make four recommendations and an observation. 1. That IV fluid bags are marked with “SINGLE SPIKE ONLY” in contrasting coloured lettering. 2. Education and prohibition of re-spiking IV fluid bags with the possibility this be referred to as “Ruby’s rule”. 3. That Queensland Ambulance Service (QAS) implement their new Clinical Practice Guideline for the priming of IV lines (which QAS have already done however attempts by the author to view this have been fruitless). 4. That aeromedical retrieval services attempt to eliminate the use of the opaque pressure cuffs and see if it is possible to trial IV infusion pumps to benefit from their alarms and safeguards. The final observation of the Coroner was that paramedics should not restock or obtain equipment from hospitals. The rationale given by paramedics for doing this is to maintain a state of operational readiness and prevent the need for restocking upon return to their ambulance branch. The risk of obtaining equipment from hospitals is that slight differences in equipment pose a risk due to unfamiliarity and this is to be avoided if possible. The Coroner stopped short of banning the practice or making a formal recommendation to avoid it. The short life and preventable sudden death of Ruby Chen is one that holds many lessons for paramedics, nurses and healthcare providers. While the recommendations and observations pertain to Queensland, Australia, it is essential for all health professionals to gain an awareness of this case. Furthermore, healthcare providers would benefit from auditing their IV fluid administration policies with a view to eliminating the risk of reoccurrence. As I sit and watch my three year old daughter drift off to sleep I make myself a promise that in Ruby’s name I will do all that I can to prevent another similar catastrophe. I implore you to do the same. And just in case you missed it the first time, NEVER re-spike an IV fluid bag. EVER. Elia Petzierides is a Victorian based Advanced Life Support Paramedic and Registered Nurse with a Graduate Diploma in Advanced Clinical Nursing. Was Ruby given too much fluid? This entry was tagged aeromedical, air embolism, ambulance, coronial inquest, helicopter, iv fluid, never respike, nursing, paramedic, respiking, ruby chen, rubysrule. Bookmark the permalink. Excellent review of a set of circumstances that lead to a tragic outcome. As is almost invariably the case this cannot be put down to a single factor but as you identified the role of re-spiking is more significant than others. As has already been mentioned, in anaesthetics we re-spike on a frequent basis to administer IV paracetamol, antibiotics or blood products as they arrive during an ongoing intra-operative resuscitation. This is a highly monitored environment where there is a minimum of one doctor and one nurse (in Australia at least) dedicated to the physiological and pharmacological care of the patient. If we introduce air into the IV set we have to forcibly pump or flush it in order for it to reach the patient, even then it is unlikely to be in the volumes required to cause serious harm unless the patient has a PFO. The other contributing factor to this case will have been the different environment of aviation medicine. What may have seemed like a small or even invisible amount of air in a 1L bag when it was hung and concealed by the pressure bag will have expanded significantly during flight. Think about what happens to your half drunk water bottle on a commercial flight pressurised to 9,000 feet. A plastic water bottle is a confined volume that limits the amount the air inside can expand. This is not the case in an IV system connected to a patient. Given this situation it is understandable how a seemingly small volume of air could have expanded, either in-vivo or ex-vivo, to cause the catastrophic consequences of this case. This is even more of a risk in fixed wing aircraft than in relatively low flying helicopters. 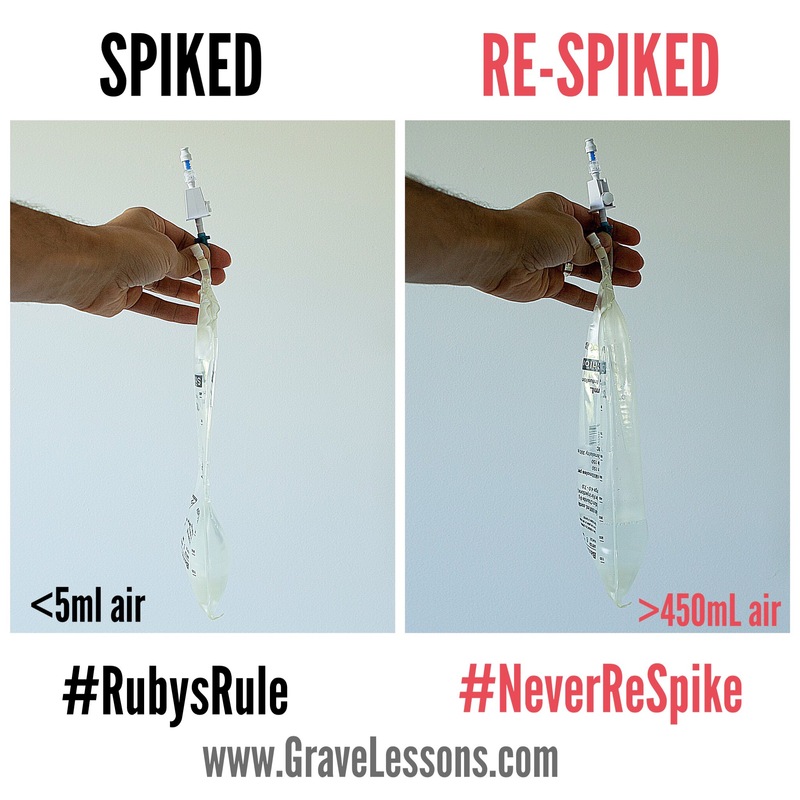 Those who re-spike should be aware of the risks and familiar enough with their giving sets to know how to deal with the problem of introducing air into the IV line. In normal situations the benefit of re-spiking is small but the risks are tiny. During aeronautical retrievals this risk:benefit ratio is significantly amplified and clinical practice guidelines for retrieval of patients should reflect this to prevent re-spiking of bags for patients prior to transfer. Would you mind explaining a scenario where respiking is required? I’m intereted to hear. The examples above sound (to my non anaesthetics mind) like you’re adding a new bag to an existing giving set. As a Flight Nurse at a large prominent Californian university hospital helicopter flight program, this would be seen as pure negligence in the USA on the part of the paramedics taking care of this child. I agree the volume of fluid ordered to be administered (250ml/hr) seem unusually excessive. However there is no excuse for a flight program which routinely transports sick and critically ill and injured adult and pediatric patients to not have IV infusion pumps or syringe pumps on board its aircraft. Failing that, at the very minimum a Buretrol device could have been used. I am somewhat shocked that the coroner determined that this could not have been predicted as it totally could have and has been observed frequently in the hospital setting , especially when using rapid infusers and a re-spiked bag. This agency and the providers in question have a lot to answer for in terms of quality of care and some serious re-educating should take place in addition to purchasing the correct equipment to provide safe clinical care. While I thoroughly understand the issue of re-spiking.. I am lost to the fact that there is far less mention of the use of a pressure bag as a means of fluid delivery in a pediatric patient, while re-spiking is an inappropriate practice, it is not the sole culprit and not the only take home point, the use of the pressure bag is what forced the air into her system, if the bag was re spiked and administered by any other method syringe, pump, Gravity , there would not have been an air embolus, at least not a lethal one… 115ml is way too small of an amount of fluid to justify pressure bag administration.. I practice at a level one pediatric trauma center and have worked at other pediatric centers and pressure bags are almost never utilized . It is difficult to control the flow rate and the risk of air embolus is high because it pushes the fluid and subsequent air in so fast.. The biggest problem here to me is the lack of education to clinical staff regarding pediatrics even more so justified by administration of what appears to be a 1000 ml bolus, unless she was severely septic this also was inappropriate .most fluid bonuses less than 500ml are best delivered via the syringe or “push pull” method with a stopcock. She probably didn’t even need that remaining fluid, and if she did, 2 60 ml syringes filled with the fluid would have done the job since pump or gravity flow was unable to be utilized, and is the preferred method in my eyes anyway . So… Yes don’t respike but even more so don’t administer fluid to a pediatric patient in a pressure bag ever! I don’t understand why this bag with air clearly in it was put into a pressure bag in the first place. It is possible to firstly see the air that has entererd a ‘despiked’ bag and to eliminate it by squeezing the bag and expelling it . Having said that there are IV fluid bags on the market in Aust that prevent air entry or fluid loss when the bag is unspiked. Given the operational difficulties of patient critical care transfer I am surprised that this type of IV fluid bag is not in use. The issue is not warnings not to respike, which at times may be necessary, but to use new and available technology ( cost same as old style ‘unsealed’ bags and been around for several years now) to make this a non issue. This story is insane. Critical care 101. The 1st thing I learned about a pressure bag is that I have to burp the iv fluids prior to using. There shouldn’t be any air in th iv bag when infusing under pressure. Personally, I take the air out of all my bags. This way I never have to reprime the tubing because no air ever enters the tubing. Let’s say Ruby was about 15kg. She had an initial 850 mls of iv fluid. If she had two 20 ml/kg boluses she should have received 600mls. Then there was around 115mls of iv fluid left in the respiked bag. The order of 250mls/hr was commenced. You can predict that the fluid is going to run out after about 20 mins. So this should have been forseen. Why was the rate so high? Was she septic? Without a pump the air will go in with the use of the pressure bag. The respike of the IV was certainily the primary cause of this event. But certainly a contributing factor is the undersized aircraft so many air medical services use today. Not enough room for an IV pump or enough headroom for gravitational IV flow (or adequate chest compressions, intubation, etc.). Aircraft used for medical transport need to meet regulations similar to ground transport units that ensure adequate space for patient care procedures. What happened is pretty obvious and something that all flight medics and nurses are trained to prevent. This was not a problem with the orders or the system, except maybe for having an opaque pressure bag/device. It was a human screw up that should have been easily avoidable. A tragedy for a child to die needlessly like this, and a grave warning that we we must always pay attention to the details of what we are doing. Lives depend on it. At a recent study day for the foundation program a fellow new grad told me about this post and how a seemingly minor part of clinical practice can cause such a catastrophic incident. Have a read and chat to nurses in clinical placement or at work about re-spiking bags and working with IV lines and infusions. Pingback: Safety in the Hospital. How Safe is it, really? - HealthInformatics, Inc.
Pingback: Patient Safety in the Hospital. How Safe is it, Really? - HealthInformatics, Inc.